Audrey is 17 and spends most of her time either at work or school and trying to keep a roof above her and her sister's heads. You see their mother is a prostitute and when she's not with one of her 'men' she is off spending the proceeds on drugs to try and forget it all. But the landlord has given them an ultimatum, get the owed rent of over $1,000 by Friday, or they are out. Audrey doesn't think things can get any worse but then her Mother is found murdered and her sisters and her and taken away into foster care, each being sent off to live with a different family. Audrey is left struggling with her emotions she wants her sister with her, but she enjoys the feeling of being a normal teenager, having a bed to herself and clothes in her wardrobe; even the shampoo and conditioner that make her hair feel soft is a real treat and then there's her foster "brother" Caleb, he makes her head spin and heartbeat. But there's one problem her youngest sister seems to be following in their mother's footsteps spurred on by the other foster child in the family she was sent to and more than anything this scares Audrey. Can she find a way to save her sister, will she really get a happy ending or is she doomed to live in sadness. 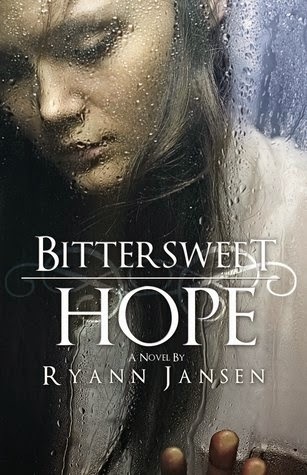 Bittersweet Hope is the first offering from Ryann Jansen and I have to admit I was completely drawn into the pages - I wanted Audrey to be ok and happy; her sister's safe and living the life every teenager should be allowed to without fear and in a safe and secure environment. I would have loved it, to have gone a bit more in depth, delve into this dark issues more, but as a YA book, perhaps it does just enough for the younger end of the audience. I look forward to hopefully reading more from Ryann Jensen and seeing how she progresses an author - I think perhaps she might just become one of my favourites. oo this sounds like a good read, not heard about this author before! I'm really getting into reading at the moment this sounds fantastic, really captivating review you have written too!